Take a walk through a unique piece of history with a tour of the magnificent hilltop Greenwood Great House. A national landmark, the house was built in the late 1700s by Richard Barrett, a cousin of poet Elizabeth Barrett-Browning, whose family was among Jamaica’s original colonial settlers. On a 45-minute tour of the property, experience the ambiance of the Victorian era as a guide cranks up an antique phonograph that entertained the house’s elite residents and guests as they waltzed in the grand ballroom. 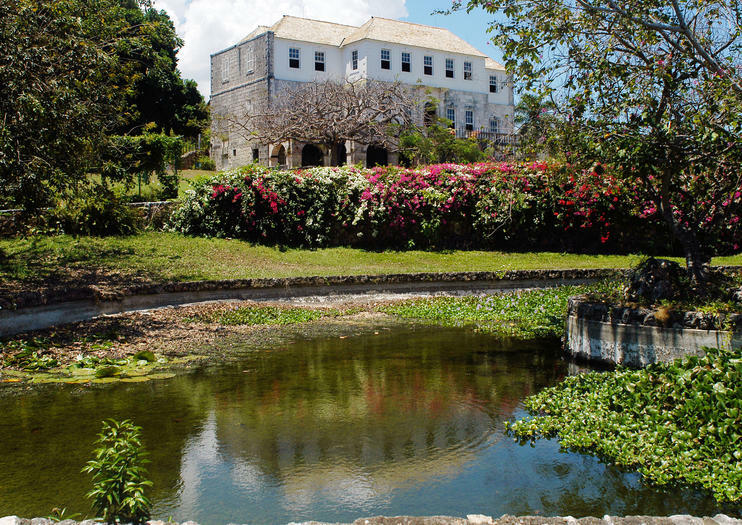 Decorated with Jamaican antiques, the mansion holds the largest and rarest assortment of musical instruments and plantation library books on the island. Original owner Richard Barrett was an important figure in Jamaica, becoming Speaker of the House of Assembly, Custos of St. James Parish, and a judge. Often cited as the most original of Jamaica's great houses, Greenwood is unique because both the house and its antique furnishings survived unscathed during the slave rebellion of Christmas 1831. Greenwood Great House is suitable for solo travelers, couples, and families with children. For a casual meal and drink, there is a pub on the premises. The house is wheelchair accessible. Greenwood Great House is located on the border of St. James Parish and Trelawny, about 15 miles (21 kilometers) from Montego Bay. Greenwood Great House is open daily, and docents dressed in colonial- era costumes lead guided tours. The last tour starts at 5pm. Greenwood Great House is often overshadowed by the more famous Rose Hall. Compared to Rose Hall, however, Greenwood is better preserved, and the tour offers a more intimate experience. The house holds many of the original furnishings, including the library, a collection of Dresden china, and haunting relics from Barrett’s slave-holding past, like a steel man-trap for catching runaways. Immerse yourself in the history and heritage of the Greenwood Great House during this tour from Montego Bay or Grand Palladium. Round-trip transportation and entrance fees included. This is a perfect tour for the history lovers and provide a unique opportunity to see two most famous Great Houses in one trip. In addition, this is the best tour for the rainy weather in Jamaica, as most of the tour will be spent inside.